RTS is selling SGP and buying PRU at the open tomorrow Friday August 28. I closed all my long positions at SPX 999 on August 12. I've been waiting for a pull back to get back in. I was hoping for a correction to mid 900, but I don't think that's going to happen. For now, I think SPX 1001 is good target to get back in, we might see it soon. My plan is to load up 50% once SPX sells off to 1001, then double down at 981 if we get there. I'm not going to buy the top 10 RTS stocks this time, I'm going with the indices. I'll buy 60% SPY, 20% QQQQ and 20% IWM (iShares Russel 2000 ETF). 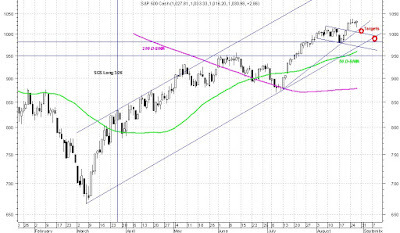 Once loaded, my stop loss would be SPX closing below its 50 D-SMA. I'll post later why I'm not going with the top 10.